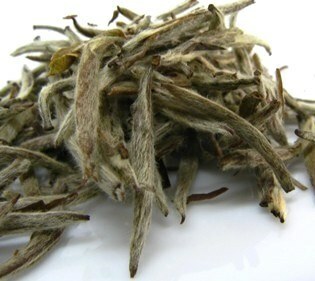 Silver Needle tea is a unique and precious white tea. It is in fact considered the best of all white teas and also the most expensive. Unlike other teas, this Chinese white tea is made exclusively of young unopened tea silver buds and no leaves or stems at all. Brew a cup of this tea and experience its mellow light, yet quite refreshing flavor. This is an amazing tea that you should not miss out on! 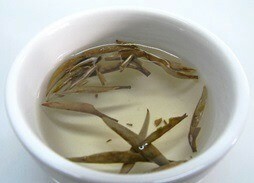 This white tea is known as Bai Hao Yin Zhen in Chinese, which basically means “White Hair Silver Needle”. 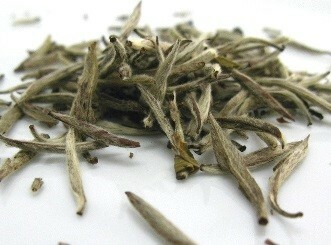 Silver Needle tea originated in the Fuding and Zhenghe counties in the Chinese Fujian province. 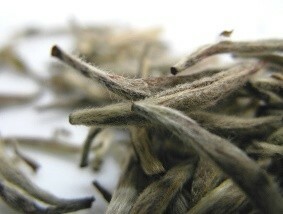 Here, this white tea is hand-picked very carefully so the buds are not damaged in the process. The best tea comes from the first flush - or first harvest - that takes place between late March and early April, sometimes taking up just two days out of the year. This is called the imperial harvest. What distinguishes white teas from all other types of tea is the minimal oxidation that this tea undergoes. It is in fact considered an unoxidized tea. Oxidation takes place when tea leaves are broken so great care is needed when making white tea so that the buds remain undamaged. Let’s take a look at how this tea is processed once it has been harvested from then tea bush. The Silver Needle buds are laid carefully in shallow baskets to wilt under the sun for a period that can take as long as 3 days. The best tea is still made this way, but as the weather may ruin a batch of tea, sometimes this process is done indoors with artificial warmth. Finally the buds are bake-dried at a low temperature and that’s it, the tea is ready to be packaged and shipped. This simple, yet delicate, process renders a healthy and uniquely flavorful tea. First let’s learn about the health benefits of Silver White Needle Tea. White tea, like other types of tea, is said to be rich in antioxidants that may be at the source of its many health benefits. Let’s take a look. Silver Needle tea contains antioxidants that help boost your immune system and build your defenses. The high amount of catechins and flavonoids may prove essential to help prevent the onset of disease. Whites teas such as this one are rich in polyphenols that will keep bacteria and viruses way. So this is a good mild tea once you start to feel the first symptoms of the flu. Antioxidants present in this tea may also help to promote heart health by lowering bad cholesterol levels and strengthening your blood vessels. This tea may aid in preventing blood clots that are responsible for heart attacks and strokes, protecting heart tissue from potential damage. Light and mellow, this is a mild tea that is perfect to improve your digestion when you feel stomach cramps or nausea. With no sweeteners needed, this tea helps to relieve stomach acidity and to detoxify your digestive system. If you are suffering from indigestion or heartburn, then don’t eat heavily seasoned foods. Pair a cup of this tea with a mild steamed dish and relax. This tea may help you lose weight by boosting your metabolism. This not only means that you will digest your healthy food better, but it may also help your body get rid of unwanted waste materials. At the same time, Silver Needle tea is likely to give you the energy you need to perform the physical exercise you need to get into shape. This tea is rich in caffeine helping you to keep motivated. If you are looking for an alternative to coffee, this Chinese white tea may be the right tea for you. It is rich in caffeine, which will keep you alert, but also in theanine, a component in tea that gives your mind a calm awareness. While caffeine in coffee seems like an immediate burst of short-lived energy, caffeine in tea is released in a slower and longer-lasting way into your system. Give it a try, particularly if you are not a fan of strong-flavored beverages. Sugar and bacteria is the major cause of tooth decay and bad breath and studies are revealing that artificial sweeteners are harmful for you. So will you have to go without sweetness in your life? No! 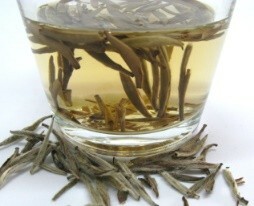 This white tea has a nice refreshing flavor with no bitterness and if you brew it properly you may get a cup of tea that is both mild and has a sweet undertone to it. At the same time, Silver Needle tea will aid in killing the very bacteria that harms your gums and teeth. So put the sugar away! To learn more about the white tea health benefits, read on and discover everything this type of tea has to offer you. Try a cup of this white tea now! This is such a healthy tea that your main concern should only be with its caffeine content and here is why. It is a common misconception that all white teas have a low level of caffeine. 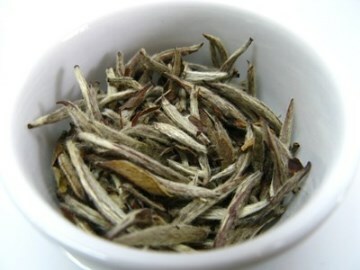 In fact, Silver Needle tea has the highest level of caffeine of all white teas, even surpassing some other types of tea. The high caffeine content is due to the fact that tea is made out of young and unclosed tea buds and it is in the bud and leaf tips that the tea plant stores caffeine to guard against insects. Although caffeine in tea is less than that in coffee, you should be aware that too much caffeine may cause insomnia, headaches, restlessness, nausea and increase blood pressure and heart rate. If you are pregnant, then you should forego drinking caffeinated teas for the duration. Silver Needle tea with its high caffeine content may be harmful for you and your unborn child. Talk to your doctor about other beverage options during this stage. There is some concern over the levels of fluoride in tea as it may have a negative impact if you suffer from thyroid problems. Older and lower quality teas tend to be high in fluoride and this is simply not the case with this tea because it is made essentially from the youngest part of the plant: the buds. 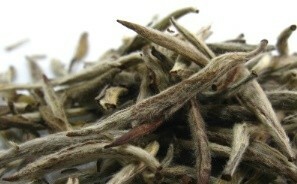 And Silver Needle is considered the highest grade of all white teas. Take this information and talk to your doctor the next time you go for a thyroid exam. A fine tea such as this one is, rare and expensive should be brewed correctly so you can enjoy its wonderfully subtle and refreshing flavor. Let’s learn how to brew Silver Needle tea. If you have a gai wan, this is perfect to brew Silver Needle tea in the Chinese way. If you don’t have one, a great alternative is a glass teapot so that you may see as the tea buds steep in the water. Start by heating water and pouring some into your teapot and cups to warm these up. Cold tea ware will bring the temperature of your tea down too much and ruin the perfect brew. Empty your teapot and make sure that your hot water is about 75ºC ~ 80ºC (167ºF ~ 176ºF) before making your tea. Consider purchasing a tea thermometer if you enjoy white teas. Do not use boiling water, as water that is too hot will cook the tea, ruin the leaves and result in a tea that has a bitter astringent flavor and little health benefits. Place 1.5 to 2 teaspoons of silver needle tea leaves per cup (250ml or 8oz) in the teapot and pour the hot water over the leaves. This tea takes 3 to 5 minutes to infuse. This is when it is worth having a glass teapot, so you can watch the buds as they dance around as they brew. White tea takes longer to infuse than other teas due to its delicate nature. For an even more subtle flavor you may let it infuse for a shorter period of time. Silver needle buds may be reinfused up to 3 times and with each additional rebrew you may need to add a minute to your steeping time. Experiment and adjust to your liking. Once brewed, you will get a pale yellow tea, much like light apricot. It does not require milk or sugar as these may alter its light, fresh and delicate aroma. This tea has a characteristic mellow flavor with a sweet aftertaste. Enjoy a high grade velvety tea that goes well with mild dishes, such as steamed poultry or milky desserts. Buy Your Silver Needle Tea Today! Click on the image or on the link below to purchase from Art of Tea your Silver Needle Tea. Taste the rarest tea of all. Don't miss the opportunity to try such a pleasant and balanced tea. Notice how the buds are shaped like needles, silver due to the white down that envelopes them. Buy your Silver Needle tea here! Silver Needle is an amazing and unique tea with a healthy profile to go with its wonderful flavor. Rare and exquisite, make sure you try it. Enjoy a cup of the best Chinese white tea!